When we last left our intrepid explorer on his quest for the glorious Sarkhan pin at PAX Aus 2014, he had just gotten his card stamped after taking a really weird picture of himself as part of the three tasks he had to accomplish before gaining the pin and taking over the world. Wait, maybe not that last part. One down, two to go. 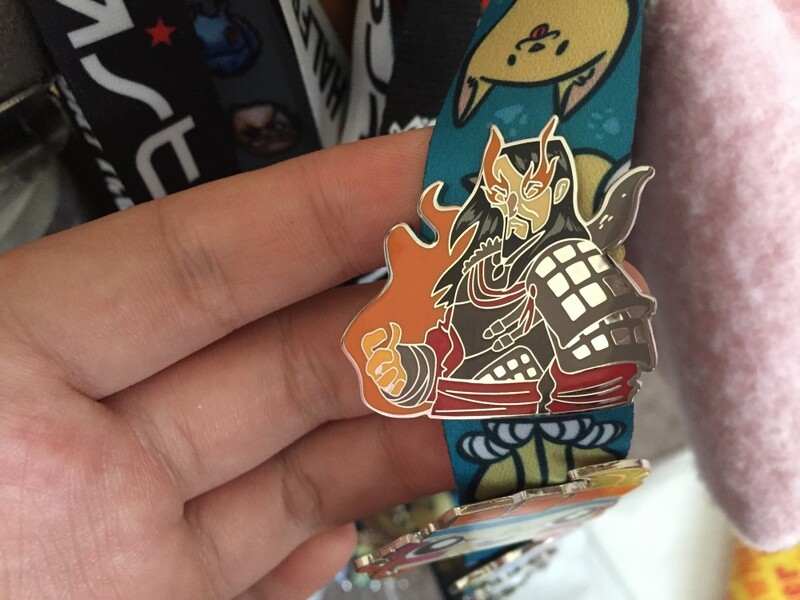 After getting my picture taken and getting one of the three stamps needed for the Sarkhan pin at PAX Aus 2014, there were just two other events I needed to complete. Spell-slinging, duelling, or learning to play Magic were the options available to me, although there was one more I can’t remember for the life of me. In any case, I had no idea what spell-slinging or duelling was, and I was pretty sure I wanted to learn how to play Magic, so the choice was between spell-slinging or duelling. With the primary goal being acquiring the Sarkhan pin in the least amount of time, the “learning to play Magic” line was a little too long for my experienced line-gauging eye. I did notice a collection of iPads setup in the Magic area, and after confirming with a passing attendant about how they were being used for the “duelling” part of the Magic exhibition, I joined the queue (which was, thankfully, much shorter than the learning to play line). 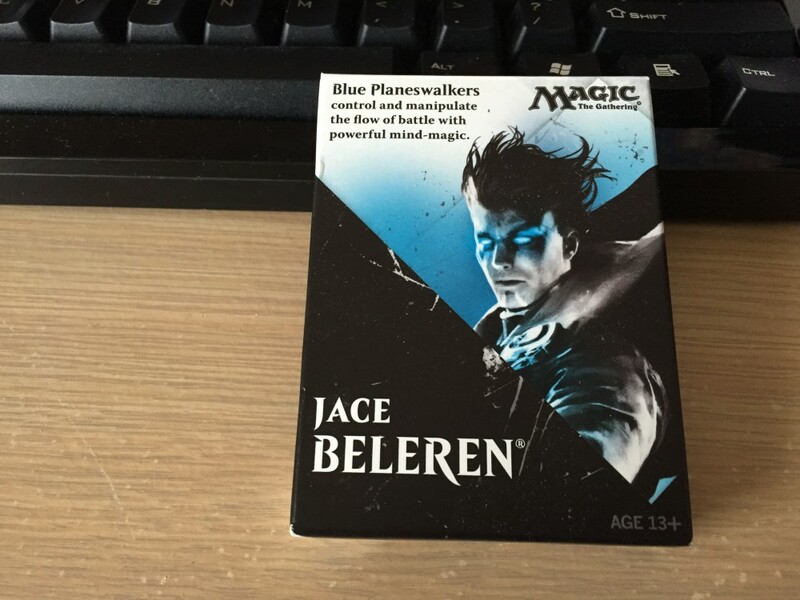 Just so we’re absolutely clear: I already knew how to play Magic. The Pokémon Trading Card Game might have been all the rage when I was in primary school, but in high school, Pokémon had all but died out, and Magic was the flavour of the month. I was intrigued by the card game the older kids were playing in the library every lunchtime, and before I knew it, had two Magic decks of my own and was spending the inevitably-too-short lunchtimes playing with and against some of the older kids. But all that was many moons ago, and like Pokémon, I fell out of the Magic scene after a few years. I stepped up to one of the iPads set aside for duelling, and when presented with the screen asking whether I had played Magic before, I selected yes. At that point I fully expected get my arse handed to me from a computer, what with its perfect decision making and innate knowledge of the game. Luckily, I had overheard a Magic staffer saying you’d get a stamp on your card whether you won or lost the duel, so my fears about losing and having to do it all again were assuaged. With my newfound brevity, I started playing Magic on the iPad, an experience that was entirely new to me. At first, I was losing. Pretty badly — the hand I drew had nothing usable, and I was still putting out lands when my AI opponent started doing damage. Nothing serious, just a few chips here and there, but enough to put me on the back foot. Combined with the trepidation and unfamiliarity with Magic on an iPad, I wasn’t really sure I would be able to win. The Magic iPad experience itself was pretty standard — like any game, Magic follows a set of rules which can be codified and turned into a series of steps, much like an elaborate dance. Only in this case, my AI opponent held the entire ballroom captivated with his delicate footwork, and I was just doing the ol’ two-step in the corner. Eventually things started turning in my favour and after a while, I had the upper hand. A few more turns later, and I had won the duel, defeating the boss. I resisted the temptation to do a small victory dance and instead settled for calling over one of the Magic staffers over, showing him my win. He grinned and congratulated me on a job well done, and rewarded me with a hole punched in my card, over the section that said “duelling”. Two down, one to go. Around the middle of last year, I picked up the Astro A40 headset to replace my SteelSeries 7H, whose microphone had decided it wasn’t for this world anymore. They’re pretty good, as far as headsets go — a little on the large side, but they’re comfortable enough for extended periods. I would have liked the option of leather ear pads for even better noise isolation, but yeah, they’re alright. The A40 is the most customisable headset I’ve ever used. You can have the microphone on the left or the right, or choose to have no microphone at all. The in-line volume control also houses a mute switch, and secondary microphone, and a button you can use as a kind of push-to-talk (at least, that’s what I think it’s used for. I’ve never actually used it). 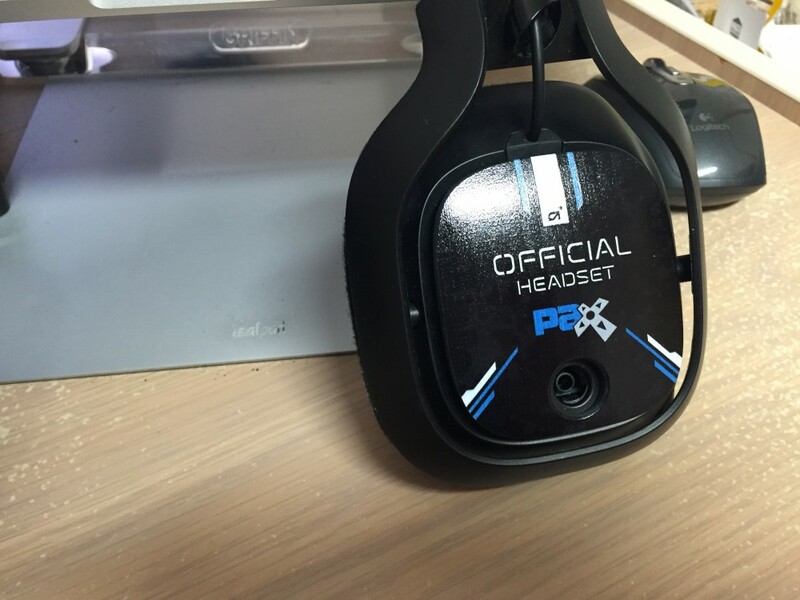 But the coolest feature about them is that you can customise the speakers with custom speaker tags. Astro were exhibiting at PAX Australia last year, and I was excited to pick up a set of custom tags for my headset at their booth. Alas, when I asked them about custom tags they said they had so few they were only giving them away if you bought a headset — I already had a headset, so that wasn’t really an option for a set of $20 speaker tags. 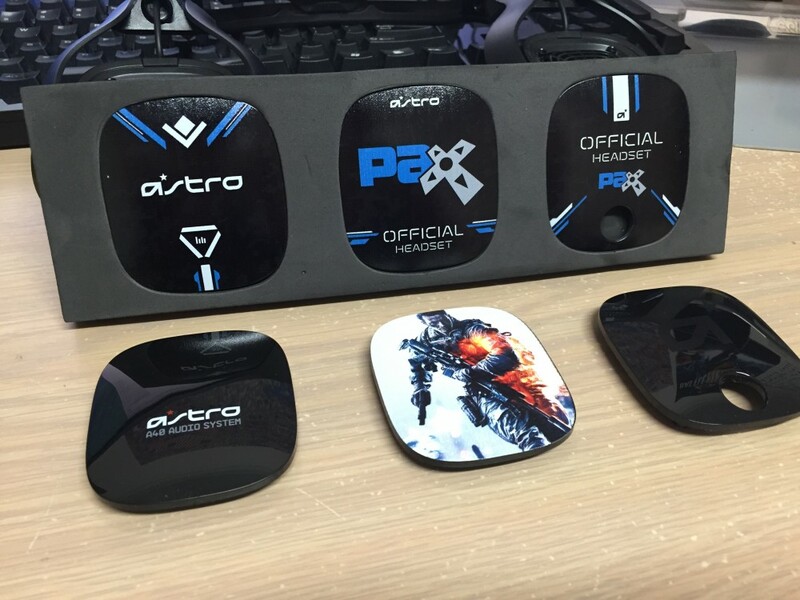 Not gonna lie, I was pretty disappointed I wouldn’t be able to get some custom speaker tags. 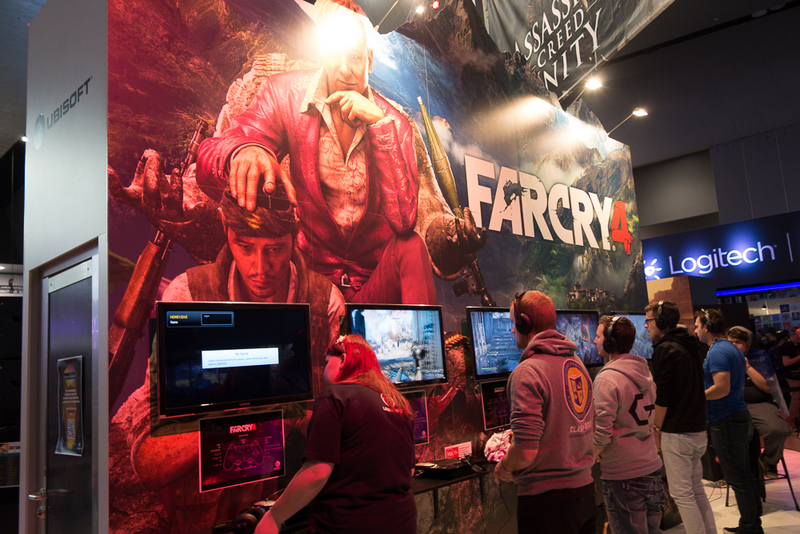 This year at PAX Australia, Astro were exhibiting once again — and this time, they actually had speaker tags on display. During the time only media were allowed into the expo hall, I asked if they would be selling the tags separately this year, and to my delight, they said yes. I came back a little later, and after umm-ing and ahh-ing over what I wanted — and confirming that I could pick up two tags for $20 (hey, you gotta ask) — I chose to go with the custom speaker tags you see in the picture above. Ideally I would have liked something Dota-related, but after looking online and seeing nothing that really took my fancy, I chose to go with the guy from Battlefield 4 and one of the official Astro/PAX tags. The Astro rep I talked to was super nice and said she’d give me a set of the official Astro/PAX tags, and throw in the Battlefield one for free, which was kind of awesome and more than made up for the lack of tag availability last year. I was super stoked with that! The funny thing is, I don’t even play Battlefield all that much. I used to play Battlefield 3 a bit, and Bad Company 2 a LOT, but Battlefield 4 has basically fallen off my radar. I’m not really sure why, but perhaps I was just sick of that kind of gameplay — these days, I’m all about the Dota.